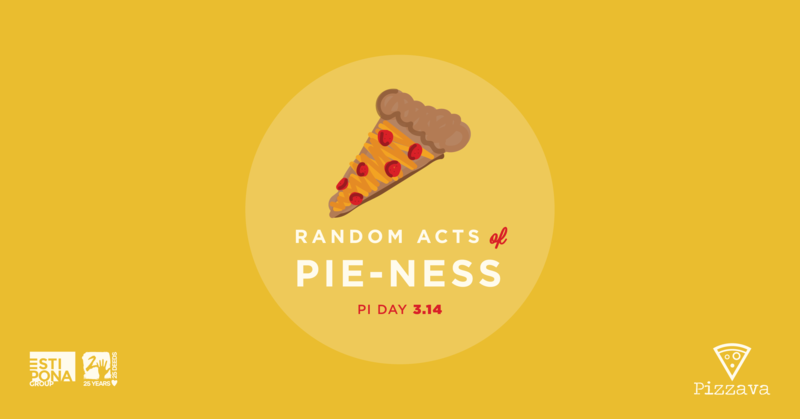 Ready to Commit a Random Act of Pie-ness? You’ve heard of the concept of “random acts of kindness,” yes? When a totally random someone does something completely unexpected and awesome for you? Well we’re hijacking the concept, and substituting “pie” for “kind,” because they kinda sound alike, and also in celebration of pi(e) day, which is Wednesday, because it’s 3.14 if you write the date with a period, which is the mathematical number for pi, which is useful and awesome in lots of mathematical applications. So anyhow, wanna do a random act of pie-ness with us? Here are the deets. This is our third annual Estipona Group Pi(e) Day Celebration. And while we typically ask you to bake or buy a pie for a random person, this year it’s even amazing-er because we’re delivering 12 pies — pizza pies, this time — to the Eddy House, a safe house and resource center for homeless youth. We’re also hoping you’ll celebrate Pi(e) Day with us this year by randomly surprising a random someone with a random pie as well. This can take the shape of a pizza pie (from — say it with me — Pizzava, preferably) or it can be the flaky variety stuffed with fruit or sweets. It can literally be given to anyone — though we do recommend it’s a friend, neighbor or someone in public service (so deserving! ), because you just can’t replicate the utter confusion, initial mild terror but eventual joy of a random stranger being handed a pie, say, while on a jog along the Truckee or emerging from the fitting room in the mall. And if you choose to participate, we kindly request this: Take a pic of your pie (and/or your happy recipient), and share it with us on the Estipona Group’s Facebook page or Instagram using the following hashtags: #PieItForward #PiDay #25Years25Deeds. So join us: Let’s turn Pi Day into Pi(e) Day, and Pie it Forward! Infinity. Like the amount of appreciation we have for you, for Pizzava, for the fine folks at the Eddy House and for Random Acts of Pie-ness. Click here for more details about #25Years25Deeds, and please join us Wednesday by committing a Random Act of Pie-ness!